Minoxidil is a commonly-used drug for hair regrowth. It’s used by both men and women. Most commonly, you’ll find it in regrowth products, such as Rogaine. Many people use it for things like male or female pattern baldness. It’s also effective in conditions like alopecia. Like any drug, though, Minoxidil has specific side effects to consider. In some cases, it can cause scalp irritation. Minoxidil side effects like flaking and dandruff are somewhat common. Minoxidil can even cause face dryness as it touches your skin. These side effects are relatively minor. Thankfully, they can often be treated. More severe side effects like palpitations and dizziness may cause you to stop using the treatment immediately. If you do experience Minoxidil scalp irritation, there are ways to help get rid of it. You shouldn’t have to choose between hair loss or an itchy scalp. In most cases, side effects caused by this drug are treatable. You can still promote hair growth and prevent more loss while getting rid of white flakes. Can Rogaine Cause a Dry Scalp? What Are the Benefits of Minoxidil? What Are the Alternatives for Hair Growth? Should I Avoid Using Minoxidil? How Do I Know Minoxidil is Causing My Dry Scalp? Even though it’s designed to help your hair, Minoxidil can irritate. It’s important to know about these side effects before trying a product like Rogaine. While it doesn’t bother everyone, people with skin sensitivities may be affected. This guide will cover the uses and benefits of Minoxidil. It will also go over the possible side effects. It can be an excellent solution for hair loss. But, it can also cause dandruff, itching, and flaking. Finding the right solution for your hair growth is important. In most cases, Minoxidil either slows down hair loss or stops it altogether. It’s found in hair regrowth products for both men and women. When used early enough, it can even encourage new hair growth. One of the primary benefits of this hair loss treatment is that it doesn’t need a prescription. It is an over-the-counter solution. Anyone can use it to help stop hair loss in its tracks. That’s why it has become so popular among men and women who notice hair thinning or want to grow new hair. Finally, Minoxidil is so popular because it penetrates through the skin of the scalp. There are a lot of hair thickening products on the market. These include shampoos, creams, and more. But, they usually only coat the hair, not the follicles. 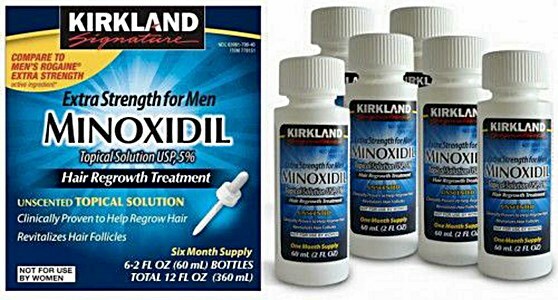 Minoxidil works with your hair follicles. It strengthens them and promotes growth from the inside out. It’s why Rogaine has remained a top hair regrowth solution for so many years. It also starts to work immediately. One of the most common side effects associated with this drug is itching. Flaking is also common. These side effects are typically due to the key ingredient in Minoxidil: Propylene glycol. While propylene glycol is needed to penetrate the skin of the scalp, it can also cause skin irritation. Associating this irritation with an allergic reaction is easy. But, most people who experience the itching and flaking aren’t allergic to the ingredient. It is simply a common skin irritant. Not everyone will experience these side effects. If you do, though, you might also see white residue and dandruff as a result of regular use. So, does that mean you should stop using Minoxidil altogether? Not necessarily. If you’re experiencing flaking from Minoxidil, you have a couple of options. Many people don’t want to give up using it altogether because it does produce excellent results for hair growth. If you want to continue using Minoxidil, consider switching to a foam version. The foaming version of Minoxidil doesn’t contain propylene glycol. It is a more recent development. Because so many people experienced irritation from the liquid version, the foam was created. It isn’t the Minoxidil itself that causes the irritation, but the propylene glycol. By removing that ingredient, you can experience all the benefits of hair growth without itching and flaking. The liquid form is still popular, even though it contains propylene glycol. But, if you’re one of the people who experience dandruff or itching from it, making the switch to the foam can make a big difference. The foam version is becoming more popular. It’s easy to use, and won’t leave your hair looking or feeling greasy. If you’re prone to sensitive skin, or know propylene glycol affects you, start with the foam. You may have tried products like Rogaine in the past, only to stop because of the irritation. Because the foam is a new development, it’s worth it to give it another shot. You’re less likely to experience those adverse side effects. There are several other products and natural solutions that promote hair growth. Making sure you choose the right solution for you is essential. Some people have more sensitive skin than others. So, an over-the-counter product may not always be the best solution. The best thing you can do is try to determine what is causing your hair thinning or loss in the first place. Once you know what’s causing the problem, you may be able to find a better solution. One of the best natural products for hair growth is Art Naturals Argan Oil Shampoo. It is designed to strengthen your hair follicles. That helps to promote hair growth, prevent loss, and strengthen your existing hair. When your follicles are stronger, your hair is less likely to fall out. Coconut oil: Helps to reduce sebum buildup and clears up follicles for stronger hair growth. Essential oils: Different oils can encourage hair growth. They also help with scalp irritation, dry skin, and flaking. Vitamins: Biotin, folic acid, and Vitamin C are essential for hair growth. Vitamin deficiencies are often linked to hair loss and thinning. Make sure you’re getting enough of your daily nutrients, and you’ll likely see a difference in your hair health. But, if your itching and flaking just started when you began using Rogaine, it’s pretty safe to assume it has to do with the drug. Pay attention to how it affects you right away. The longer you use it, the more irritation you may experience. Itching and flaking can, unfortunately, lead to more hair loss. Every time you scratch your head, it can do more damage and harm the follicles. If you scratch your scalp, you might even open yourself up to infection. Once you can determine if Minoxidil is causing your itchy scalp, you can decide how to fix it. In most cases, switching to the foam version of Minoxidil can help. Other people may need to stop using it altogether. Maybe you’d even feel more comfortable with a natural alternative. Don’t be discouraged if Minoxidil causes you to get dandruff or an itchy scalp. There are several solutions you can choose from to remedy it. We hope this guide has been helpful if you’ve had trouble with Minoxidil. It can be frustrating for a product that works so well to have harmful side effects. But, by making a few simple changes, you can still experience hair growth without irritating your scalp.